Other than the fact I absolutely love the name of the bag (can you tell I have a crazy sense of humour?!) I like the design. 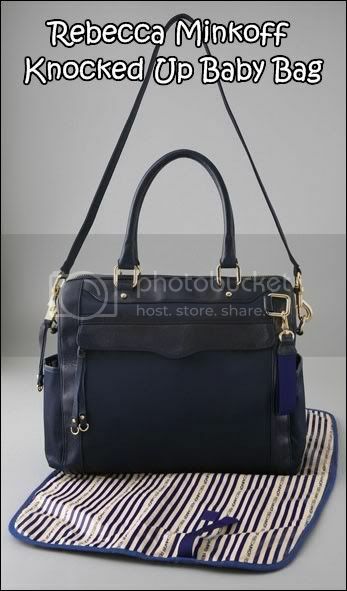 Its at once chic, city savvy and does not scream MOMMY BAG! In fact it looks like something you’d take to the office for a serious meeting then realise belatedly that what you have in there are not your documents or files but your baby’s diapers and bottles LOL…. Besides its never too young to start them out with a designer bag. Teehee… You can get this at Rebecca Minkoff or at Shopbop (on sale now) where there’s free international shipping until 30 June 2009. I loooove the look of the bag but from experience I know a backpack with lots of zippered pockets is the best thing to carry around esp when travelling. This kinda bag is the sort of diaper bag one brings along when one has an army of nannies. Or when one’s baby has a playdate with some posh Jakartan mum and one needs to impress a little… teehee. Still… I wouldn’t mind getting this for my birthday! but it is nice looking for usre! That is so cute! If I had a baby I would so get it!